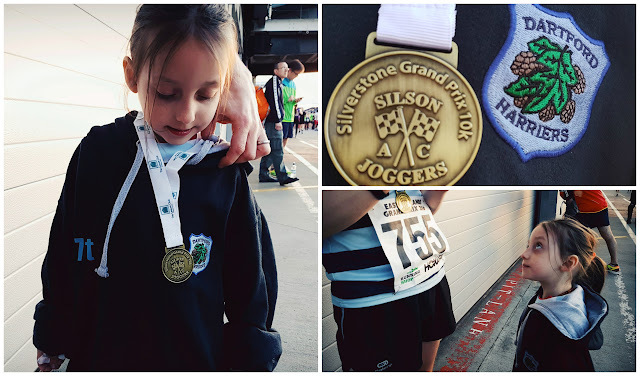 The Silverstone Grand Prix 10k race is a midweek race hosted by Silson Joggers and takes place on the Silverstone motor racing circuit. The race has been held here since 1984 and 2016 marked the 33rd running of the race. 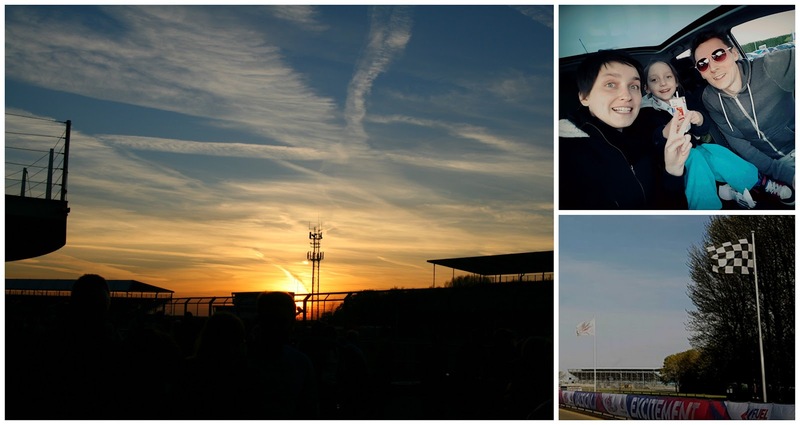 It comprises the East Midlands Grand Prix Series, the Milton Keynes Schools Challenge and the Motor Sports Challenge. The race is also open to handcycle and wheelchair athletes. I entered as an affiliated runner online for a very reasonable £10.50 (and that also included the admin fee that Runner's World apply). 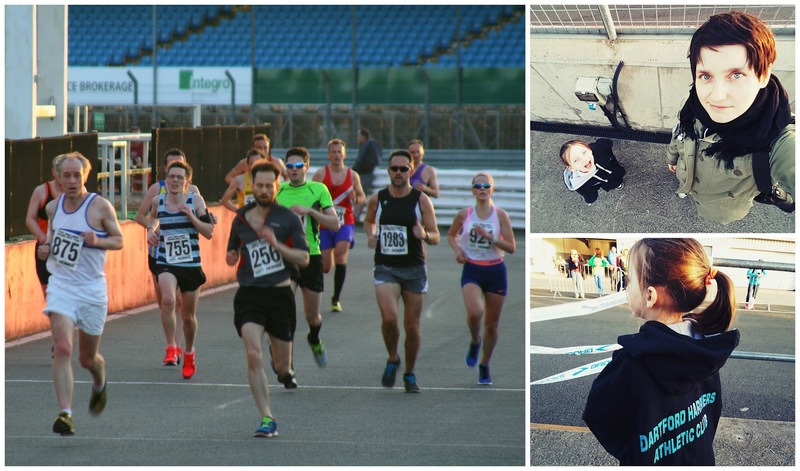 Even with this race being a midweek affair, it still manages to attract a very large field and with over 1,000 entrants is actually the largest 10k road race in the Midlands. Being held at a race track that is used to coping with 300,000 people on F1 race day, the 1,172 runners plus their supporters were barely a blip on the venue's radar. The Silverstone Motor Racing Circuit was built on the site of the former World War II bomber station, RAF Silverstone. This was home to Wellington Bombers during the war, but soon after the war had ended it started to be used for motor racing. 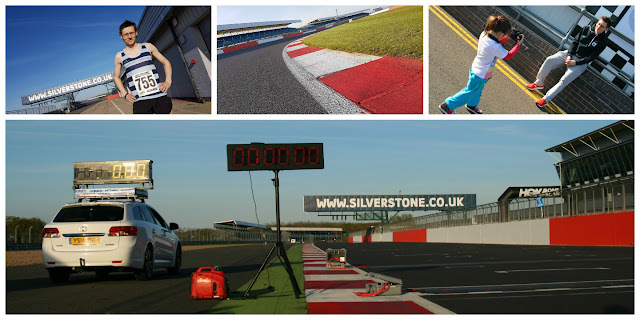 The track itself has been modified and improved many times over the years and Silverstone is, of course, best known as the home of the British Formula 1 Grand Prix. After driving over from Dartford earlier in the day and spending the afternoon hanging out in Towcester, we reached the venue just a few minutes before 5.30pm which was the earliest possible time that we would be allowed onsite. The Silverstone staff put us in a holding area with a few other early birds until they were ready for us to enter the car park. The car park itself is located within the perimeter of the track so we had to cross the track via a couple of bridges before we reached it. The Race HQ was located inside one of the pit garages and after collecting my number (with in-built timing chip) had plenty of time to mill around taking photos before starting my warm up. The toilets were about 100 metres away from the pits and were more than sufficient for the numbers of people on-site for the event. The Silverstone gift shop and the Paddock Cafe were both open so we milled around those too. The wheelchair race got under way at 7.25pm and the main race followed at 7.30pm. The participants generally started to get in position about 20 minutes beforehand and there was a great atmosphere as we waited in the warm spring evening's sun for things to kick off. Eventually my wife and daughter had to leave the start area and they found a nice spot to watch from the pit lane. 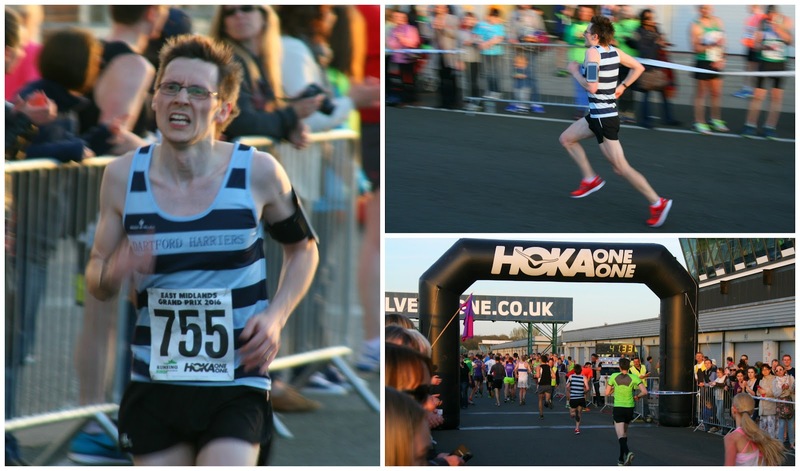 After they left, I bumped into a former Dartford Harriers runner who was the race adjudicator for the evening. The 10 kilometres are made up by running two, clockwise laps of the pre-2010 main circuit which is called 'The Bridge Circuit'. The Bridge Circuit has now been decommissioned for motor racing, mostly because the bridge itself is in very close proximity to the track and has been deemed unsafe, especially for motorcycle racers. For the record, in 2010 the track facilities were upgraded and a new, modified track layout was introduced. This new track layout is not used for the 10k race. As you may have gathered, this race takes place on a 100% tarmac course and although there are a couple of small changes in elevation, it's all very gentle and can only be classified as being flat. Perfect conditions for an outing in my New Balance Fresh Foam Zante v2 running shoes which are becoming a favourite of mine. At 7.30 sharp, the air horn was sounded and we all headed off down National Pits Straight. Before the race I had thought about what kind of time I would be able to run on a flat 10k course and based on my recent 5k time of 20.35 at the Dartford Heath 5k, I predicted a finish time of around 43 minutes with a perfect race possibly allowing me to dip just under that and into the 42's - a few various online calculators suggested the same. I had also managed to forget to bring my stopwatch so although I had my phone's GPS fired up to track my route, I wasn't able to check any splits while out on the course. So I reached the first corner, Copse, then proceeded through Maggots which for the evening was dubbed 'the bend of noise' and was manned by a a group of about 20 children with various noise making devices and instruments. Then followed Becketts and Chapel. Trying to hit the apex at each corner was difficult due to the sheer numbers of runners, but I stayed patient and didn't do anything silly. Some of the corners were taken a little wider than I would have liked but there was no other choice. Along Hanger Straight and through Stowe, along Vale and into Club. It's at this point that the course reaches the new starting grid and the striking new building called 'Silverstone Wing' - this houses the brand new pit lane and race control areas which have been necessary to ensure Silverstone remains the home of British Motorsport. After this, the course reaches Abbey, Farm and Bridge before entering the twistiest section through Priory, Brooklands and Luffield. This is followed by the long sweeping right hander at Woodcote which leads back onto the National Pits Straight. I have no idea exactly how long it took to run that first lap because I didn't look at the trackside clock to check, but I did spot my wife and daughter and gave them a quick wave. Looking at my Strava data it looks like I hit the 5k point in around 20.40. So I continued onto lap 2 where there was a water stop just after the 5k point but I just focussed on the road ahead and got on with the job. As I reached 'the bend of noise' for a second time the track was less congested so I held up my hand a got about 20 hi-fives in a row from the children, which made me smile and I felt a little more relaxed for a bit. For the rest of the second lap, I found myself neck-and-neck with a fellow runner and I found it really useful to have someone to run alongside. However, as I reached the beginning of the 9th kilometre I started to fade (this section has a little teeny-weeny rise in elevation so I think that lost me a bit of pace - it was four seconds slower than my previous 3 kilometres). Once through that and into the last kilometre I managed to pick the pace up and catch up with and overtake my 2nd lap companion. The cheers from the crowds as I headed into the pit lane towards the finish line really gave me a boost to put in a strong finish. Overall, that second lap was a tad slower than the first and I've worked out that it took me 20.51 to complete it. That gave me an overall chip time of 41.31 which was way quicker than I would have thought possible in what I thought was my current shape, so I'm very happy with that. Putting this time into a race time predictor suggests that I could be just about fit enough to run a sub-20 5k again, so I'm looking forward to having a crack at that pretty soon. Back to Silverstone, and with the race complete I was very grateful to be handed a bottle of water followed by my race medal. The water was my main priority as I could feel my legs starting to cramp up a little. After downing it I was reunited with my wife and daughter and we headed off to the car to have our post-race evening picnic while watching a great sunset. 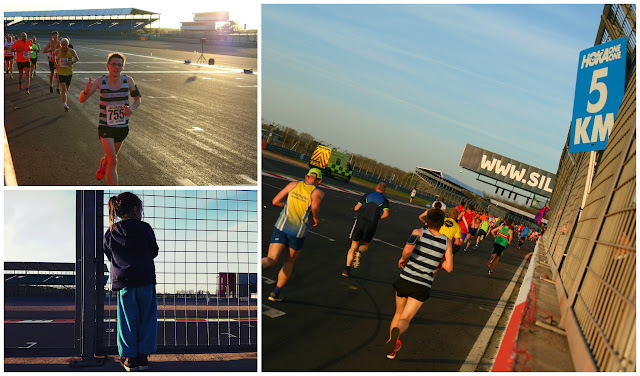 We'd all had a thoroughly good time and thought the race was very well organised - definitely worth the 200 mile round trip and who knows, we might even make a return trip again in the future.